I made a farro salad this weekend. I made it two ways, a composed warm salad and jumbled cold salad. They both worked fine. In fact, it is rather nice to try it both ways. The composed salad is small and makes for a great appetizer and when you are finished you can just dump the leftovers into a bowl and set it in the fridge for the next day. 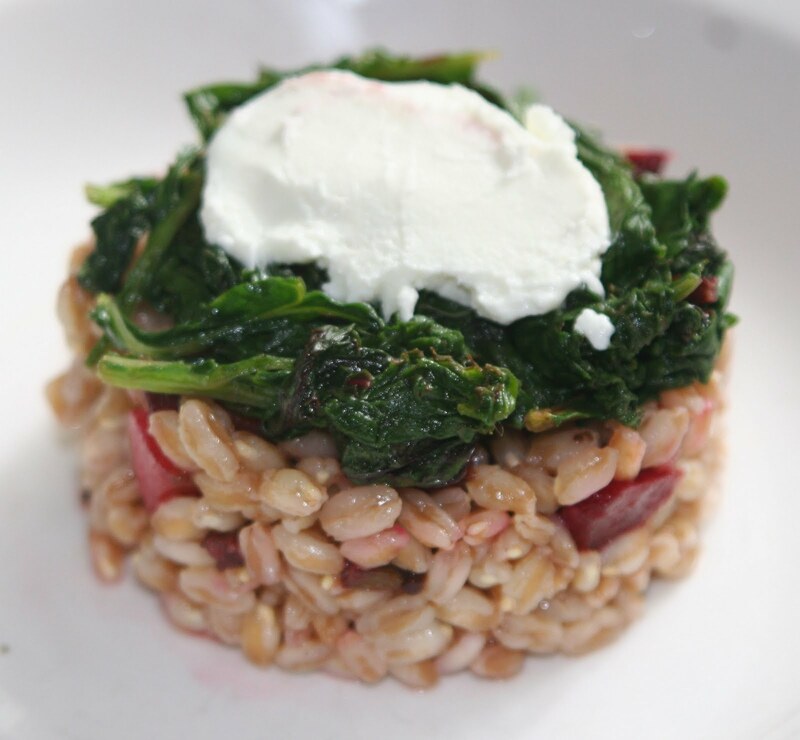 Everyone seems to have his or her own special way to make farro. Some people cook it like beans, rinsing and soaking. Some people cook it the way the French often like to cook rice with the grain in a big vat of water, cooking and then draining. I tend to make it like rice with a ratio of 1 part farro to 2 1/2 parts water. 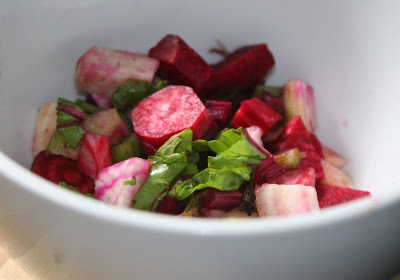 I used baby beets from my garden, peeling them and sautéing them, which left them with a nice, slightly firm texture. If you use large beets, you might want to roast the beets. 1. Add the farro and water to a small saucepan, bring to a boil, reduce to a simmer and cook 20 minutes. 2. Cut off beet greens, remove stems, roughly chop or tear and reserve. 4. Cut about 1/4 cup of the beet stems add to the cubed beets and sauté in a medium skillet with a little oil, until just tender, about 10 minutes. 5. Add the balsamic vinegar and cook another minute. 6. Add blueberries and cook another minute. 7. Remove the beets and blueberry mixture and set aside. 8. In the same skillet, sauté the beet greens until wilted, about 5 minutes. 9. 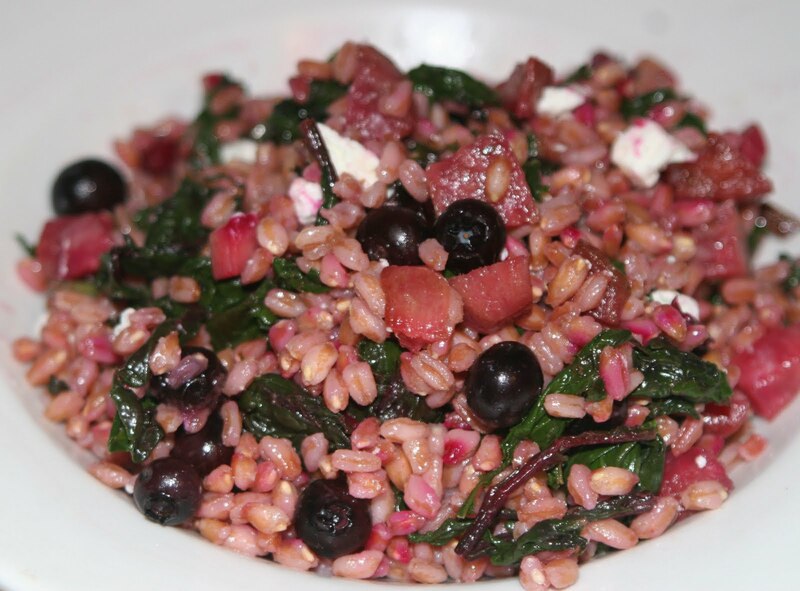 Toss the farro and beet mixture together, and season to taste. 10. Pack into a ring mold about 3/4 full; then add the sautéed beet greens and top with a piece of goat cheese. I like to eat this composed salad warm. Then I take the leftover farro, beets and greens and toss them together and refrigerate. When I am ready to serve, I give it a toss and add in the goat cheese. Warm or cold, prissy or tossed, this offers several options with a single recipe. Great recipe! it looks like rice n' beans but it tastes better all the way.